Match play 21 shares much in common with Spanish 21 and Pontoon, including non-standard decks and bonus payouts for specific hands, but there are a few unique quirks which make this a game all of its own. Here’s our rundown on the rules, strategy and house edge of matchplay 21, as well as where to play real money games online. The first thing to note about this game is it does not use the standard French deck of 52 cards. Instead, match-play 21 employs what is often known as a Spanish deck, where all the 10-spot cards are removed. This leaves us with 48 cards in each deck, which makes it slightly more difficult to draw a natural blackjack hand. All the picture cards (Jacks, Queens and Kings) remain, however, and hold a value of 10 as per usual. The anytime surrender rule is the big one here, as it means you can even cut your losses after doubling (known as “double down rescue”). Liberal rules on when you can double down also limit the house edge, as do the player-friendly interpretations for natural blackjacks. In some versions, especially at Internet casinos, you can double down on any number of cards, which greatly improves the player’s odds. Rules regarding split Aces can vary widely, while some variants allow you to split pairs up to four hands. Like Pontoon and Spanish 21, match play blackjack offers a number of special payouts for hitting certain hands. Most of these bonuses pay better than the 3 to 2 odds you get for a natural 21 in standard versions of blackjack, which is why match play games are gaining popularity with casual players looking for that one big win. 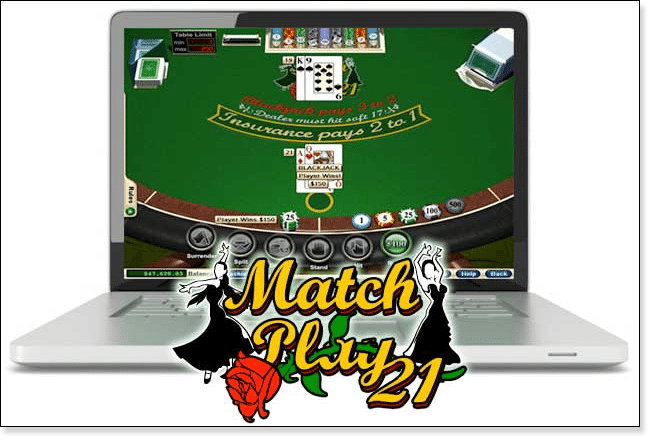 As you can see, the jackpot hand – called “match play 21”, funnily enough – pays out at 40 to 1, which is far more lucrative than anything you will find in a traditional Vegas blackjack game. Also note that a natural 21 still pays 3 to 2, despite the fact it is much harder to draw without any 10-spot cards in the deck. These blackjack bonuses favour the player overall, but there is a catch: many of them cannot be claimed if you split or double down. For example, even if we drew a pair of Sevens, split them, and then got three Sevens on one of the split hands, it would not qualify for a bonus payout. The curious thing about matchplay blackjack is it encourages players to abandon the principles of basic strategy. This is down to the bonus payouts, several of which become invalid after splitting and doubling. So the question is: do you split those Sevens, or do you hit them and go for the bonus? Here is a brief outline of what to do when you’re not sure whether or not to stick to basic blackjack strategy. If dealer shows Six or lower, always split. If dealer shows Eight or higher, always hit. If the house shows Seven, hit only suited pairs and split all others. Hard 13 against dealer Six. Hard 14 against dealer Four. Hard 15 against dealer Deuce. Soft 18 against dealer Two, Three, or Eight. Hard 14 against dealer Five. Hard 15 against dealer Three. Hard 14 against dealer Six. Hard 15 against dealer Four or Five. Hard 16 against dealer Deuce, Three, or Four. Hard 17 against dealer Eight, Nine, or 10. Soft 19 against dealer 10 or Ace. When played with these tips in mind, the house edge for matchplay 21 sits somewhere between 0.76% and 0.81% (depending on specific rules for doubling, splitting, and so on). This is a bit higher than most forms of online blackjack, but still far better than many of the 21 tables found at land-based casinos these days. Not many online casinos offer real money match-play 21 at the moment, and for a very simple reason: Spanish blackjack and pontoon are much more popular. These are the games that inspired match play BJ in the first place, after all – from the bonus payouts, to the short decks, to the double down rescue rule. They generally come with a lower house edge, too – pontoon tables in Australia and New Zealand are among the best-value games on the casino floor. Trusted blackjack sites like Royal Vegas and Casino-Mate stock the Spanish Blackjack Gold Series game by Microgaming, which sets the benchmark for digital gameplay quality and sports a casino edge of just 0.38%. Multi-developer gambling sites such as Thrills.com, Guts.com and G’day Casino also boast online pontoon games from leading brands like BetSoft and Net Entertainment. Each of these blackjack casinos is safe and secure, with all games regularly tested and approved by top authorities such as eCOGRA (eCommerce Online Gaming Regulation and Assurance).